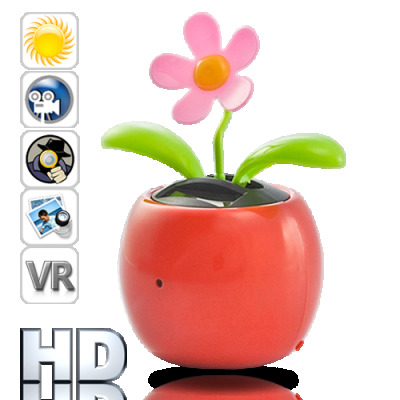 Successfully Added 720P HD Camera - Flower Bobble Head (4GB) to your Shopping Cart. This Flower Bobble Head acts and moves just like your favorite desk and car dashboard accessory, but inside is actually a high-definition 720P camera lens capable of capturing video, pictures, and audio! Inconspicuousness is key when it comes to gadgets, and it doesn't get any more low profile than this flower bobble head. Just take a look at the one you have on your desk or on your car's dashboard - it's completely identical! From the way its leaves gently flap up and down to how the flower shakes left and right, this flower bobble head is your favorite desktop gadget reborn as a secret ing weapon! So what else makes this camera so appealing? Is it the high definition 720P video, so you can capture everything in high quality and high resolution? Or maybe its the high sensitivity mic for voice recording, which will record every secret spoken. Or even the instant 1600 x 1200 picture snapshots? Whatever it is, this HD camera has something for everyone! Unique cameras like this don't appear all the time. Order your samples now and get ready for the rush of orders to come in to your online store. Brought to you by Chinavasion, the leader in wholesale electronics and gadgets. Looks and moves just like a normal flower bobble head!